I find it amusing when someone tells me about their business buyer using discounted cash flow as a method to value their business. When I hear this, I know there is a very good chance the buyer is going to get a great deal and the acquisition will financially fail. If you’re curious about my opinion, then you’ll just have to read on. What is discounted cash flow. I hate jargon. Discounted cash flow is jargon that describes a very complicated way of valuing a business. When someone uses discounted cash flow (DCF to let me be lazy) they are saying that a stream of cash flows will have a certain value in time. The guesses and I do mean guesses that valuation people use is what is the interest rate, the discount that is put on a business based on its risk, what is the growth rate for the business and what is the cash flow or EBITDA (Earnings before interest, taxes, depreciation and amortization). This information is then put into a formula where a value of your company will emerge. I can only tell you one thing about this method of valuation, it’ll be wrong. The value will either be too high or too low. Why is it flawed when valuing a small business? The growth rate that’s being used will be wrong. The cash flow that’s being produced could very possibly be an anomaly. Nothing happens in a straight line with a business. Private businesses are just unpredictable. Your growth will be too low to get a reasonable valuation. When you look at the above issues you’ll see something in common. They all depend on predictability in your business. If your business is anything like all of the businesses I see there is little to no predictability in most smaller private business.That’s the problem with DCF, your business just isn’t predictable enough to make it work. You’re not paying for what the business will do. Every time I bought a business where the purchase price was based on what was going to happen, I got burned. When I decided to only pay for what the owner had produced, I started getting deals that actually paid off. Most people won’t understand it. It took me a long time to understand how discounted cash flow works. I want you to easily understand how to value a business. I don’t care whether you’re a buyer or seller, if you don’t understand how someone is valuing your business you could be in for a very rude awakening. I hate it when advisors of any stripe tell you that you just have to trust them. All this means is the advisor doesn’t understand a technique well enough to explain what they’re doing in terms you can easily understand. When your advisor can’t translate any strategy to plain English you’re in trouble. If you don’t understand what’s being used to value a business you’re interested in, you either need to stay with it till you understand or just move on. If you’re holding paper, you really want a deal that works. Most of the time I see DCF used by buyers who have been formally trained in a business school. I also often see buyers wildly over value a business by using DCF. If you see that your business has been overvalued and you’re going to play bank for a significant portion of the sale, you should be very careful. When a business is overvalued, it’s only a matter of time before your payments slow or even stop. If you’re selling to a private equity group, beware. Many times private equity groups will use DCF to value your business and use your last year or two as what’s as a guideline for what’s going to happen in the future. If you’ve been fortunate and your company has grown at a 20% clip, you could receive a very nice offer for your business. If you accept the offer you have to be aware that two unfortunate things that might happen. The first is you’ll be replaced as CEO if your growth doesn’t continue. A 20% annual growth year after year is a very difficult thing to do. The second and the one that’s most important is that you have to beware if you’ve either taken part of your purchase price in stock or holding paper. The problem with both is that if your company doesn’t perform the way your private equity groups think it should, there’s a good chance they’ll just stop paying you or make the value of your stock useless. Then you’re either going to accept the change or start a legal action. Both are not attractive options. 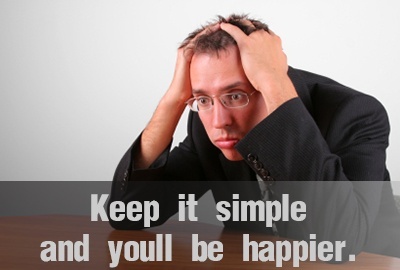 Keep it simple and you’ll be happier. I think it’s just easier to use historical numbers to figure out what you’re going to pay for a business. Keep your valuation process simple and one that you understand. You’ll be happier and in the end you’ll buy or sell at a fair price. What do you think about all of this? Just hit reply and let me know.